Alex Fein is defamatory; so what’s news? I was approached by the Rabbi of that institution, to ask a revered Modern Orthodox Rabbi (not Chareidi or Chabad) to get an unbiased view given the Rabbi was Chabad (I’m not, of course) but I happened to be learning Torah close to that Rabbi for a few months and he knew I regularly was in touch with Rav Schachter based on other discussions that arose daily. 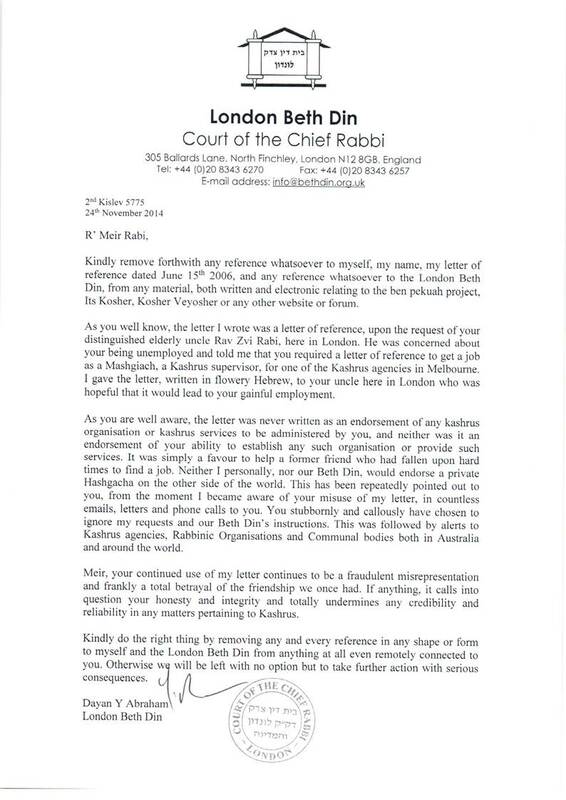 Rav Schachter was not told any names as it is not relevant and in fact, it wasn’t the only question asked. Rav Schachter was quick and firm in his response (he’d obviously come across it). Guess what? Mizrachi had this same Psak from their Rabbi at the time (no, not Rabbi Sprung) about a different functionary, so it’s hardly a new issue. There is no line about female circumcision and is just some inflammatory nonsense from someone purposefully deflecting from the issue because she has been exposed. She also knows that what I was asking her, was about whether should she should have a SON and whether she would offer the choice of him having a circumcision or she would force him, like the fundamentalist she accuses me, and my Rabbi and others to be, and have it at eight days. I simply noted that she didn’t have to face that question because she has only females to date. It is rather sick to contort that in the way that she has, but on the other hand, it is revealing, because anyone normal can read what she has written and seen what I have written and see immediately the falsehood she spreads. Alex is ageist. That is clear in her response as sent to me by someone. She wouldn’t have a clue, but I visited old people in those homes every week for over two decades (they are dead now), so don’t think I’m some person who hangs around with youngsters like Alex only. Frankly, if she wants to defame me in public and get excited about that, good luck to her. I am not responding to her gutter sniping, foul language, and lies. Ho Hum. Take a Bex and lie down for a rest Alex. I don’t understand why a private argument gets played out on the internet for everyone’s “enjoyment”. You are not teenagers and you are making the practice normal behaviour. Steven you’re one of the more intelligent commentators on my blog. I was surprised to read your comment. To summarise: one of the greatest Rabbis in our generation is pilloried by Alex, who happens to also be married to my cousin and has eaten in our house. She currently In response, Alex contorts my reply with hubris ex Nihilo. Her mother enters and submits a comment which adds little except confirm she is her loving mother. I respond to the mother in case there is an angle I have missed. Instead yet another diatribe only this time I get ‘threatened’ by Alex that she’s going to tell the world about some sinister secrets. At this post by I pull up stumps and realise I’ve been dragged through the bushes. I can assure you I’m quite capable of responding, but decide it’s a ברכה לבטלה. Yaron and I go very far back, including sharing a room in yeshivat hakotel in 2005. I’ve davened fairly regularly at Emmy Monash since 2002-it has been my primary shabbat morning minyan since 2013. I cannot recall EVER seeing Yaron there, whether davening or in some other capacity. It’s possible that I’ve missed him, but if he’s come to Emmy (as opposed to Smorgon House or some other location) in the last 15 years, I would hazard it would have been a very rare thing. Isaac, Alex misunderstood your comment about male circumcision and the baby giving his permission for the Bris, to be referring to her daughters, as you mentioned her two daughters immediately after, and she clearly says so in her opening comments, “who makes weird, creepy allusions to female circumcision and my daughters…” and that is what flipped her out. You never referred to FGM of her daughters but she thought you did. I PMed her but not sure if she saw it.